Tijuana, Mexico – Lying in the shade in a little green strip between a walkway and a fence in the Tijuana stadium-turned-shelter for Central American migrants and refugees, Daniel Folgar launches into a chronology of the bones he has broken and re-broken. “My height and growth was no longer normal,” says 49-year-old Folgar, who is 1.4m tall, as his crutches rest against the fence next to him. “I practically have no family. I have not been able to work,” he adds, explaining that he hopes to find work in the US to support himself and afford supplements. 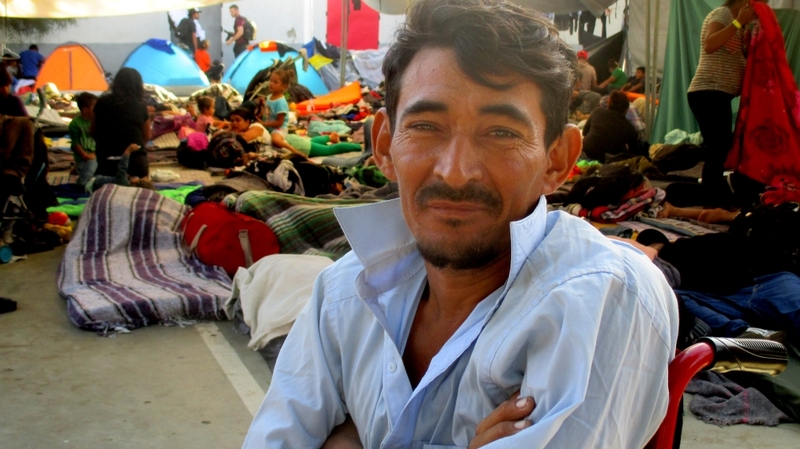 Folgar arrived in Tijuana last week with hundreds of other participants of what’s now being called the Central American exodus. 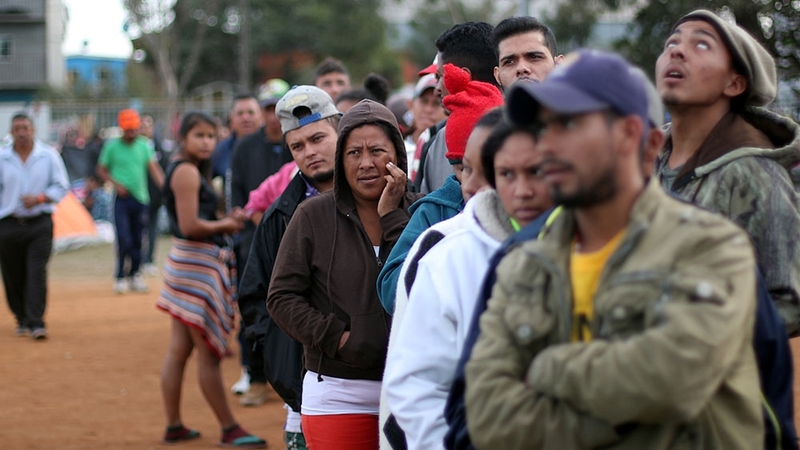 Six thousand people are now at the US border in northwestern Mexico and thousands more are on their way, with the goal of applying for asylum in the United States. The journey has been gruelling, especially on Folgar who runs the risk of breaking or fracturing a bone. He’s found comfort though in a friendship with Sergio Caceres, who travelled with him for the more than 2,500km from Guadalajara, Mexico where they met. “The doctor said it could only be done if I had money,” Caceres says, adding that the surgeon told him the best option would be to try to get the surgery in the US. “My country is very poor. The millionaires have all the money,” he says. “I would have never made it all the way here with the walker,” Caceres says, explaining he was unable to use the seat to rest because he would always slip off. The two friends, like most of those part of the collective exodus, plan on crossing into the US, but due to the Trump administration’s “zero tolerance” policy and recent extreme measures, their futures seem uncertain. Last month, US President Donald Trump ordered the deployment of more than 5,000 US military troops to the border. Since then they’ve been installing concertina wire along fences. Nielsen tweeted Monday’s lane closures came after border officials “were notified that a large [number] of caravan migrants were planning to rush the border”. No such rush occurred, and Pueblo Sin Fronteras, the cross-border social movement group accompanying the exodus, condemned the measure and Nielsen’s message as ways to stoke anger and impatience against the refugees. “Nielsen’s false comments about the Refugee Exodus are a deliberate attempt to mislead the public and demonize refugees fleeing government-sponsored violence and displacement,” Pueblos Sin Fronteras said in a statement Monday. Separately on Monday, a federal judge in San Francisco temporarily blocked Trump’s latest measure to restrict asylum seekers, which including barring those who cross between official ports of entry from being eligible for asylum. “Whatever the scope of the President’s authority, he may not rewrite the immigration laws to impose a condition that Congress has expressly forbidden,” Judge John Tigar wrote in his ruling. Under proposed changes to the definition of what constitutes a “public charge”, immigrants seeking green cards or other visas would be judged negatively if they may use public assistance programmes, including food stamps, non-emergency Medicaid and housing vouchers. “The proposed public charge rule would discriminate against immigrants on the basis of disability and scare people with chronic illnesses away from getting the healthcare they need to thrive,” Madison Hardee, a Center for Law and Social Policy Lawyer and Senior Policy Analyst, told Al Jazeera in an email. Coronation Street spoilers: Sally Metcalfe left for DEAD after prison bust-up?